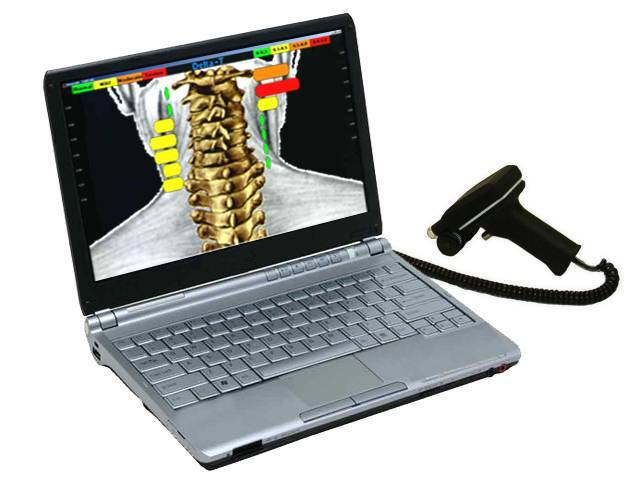 Skin Temperature Differential Analysis is The primary objective measure for determining the presence or absence of an upper cervical subluxation(nerve interference due to head/neck misalignment) as well as overall progress from a neurological standpoint. The Tytron Infrared or Kale Thermoscribe is the primary instrument used in the KCUCS procedure. The Chirometer is as well employed, especially when checking infants and toddlers under the age of 4. Leg Length Inequality is used on each patient on every visit as a secondary means of measurement. The KCUCS procedure utilizes Pattern Analysis, first introduced in the BJ Palmer Research Clinic and further developed by Dr. Stephen Duff of California. The KCUCS program has been influenced in regard to Pattern Analysis in large measure by Dr. Bryan Duff, Dr. Stephen Duffs son who is currently carrying on his dad's work (1). The KCUCS performs graph readings with posture constant chairs, measuring starting and ending points for the highest level of specificity. Constants are established and analyzed to determine what specifically is going on with any given patient on any given office visit. A heavy emphasis is placed on knowing when to make a correction and when not to make a correction based upon understanding the 5 distinctive graph readings, with numerous combinations and variations, as well as Leg Length Inequality examination. The purpose is to have each patient hold their correction for the longest possible time with the understanding that "Holding is Healing". As stated, the longer a person 'holds' their adjustment the stronger the Medullary Lock becomes relative to that specific person. With the KCUCS procedure we see this as a vital step to recovery for patients suffering from more serious and/or long-term problems or patients simply wanting to express their best potential health.